The tour of “Zenkoji Shichifukujin Meguri” stretches for approximately 2.5 km, and will take you on a little journey to visit the Seven Deities of Good Fortune enshrined along the neighborhood of Zenkoji Omotesando (the central street) from Nagano station to Zenkoji temple. It will be a great opportunity to enjoy a little walk through the town at your own pace, and to make your passage to Zenkoji temple even more bless-filled. ●Karukayasan Saikoji Temple (Jurojin) Jurojin is the god of longevity, and is believed to be the immortal reincarnation of Lao-tze after his ascension to heaven. On the head of the cane he holds in his hand is the scroll that records the secrets of longevity. He is responsive to prayers regarding longevity, wealth and prosperity. ●Nishigocho Akiba Shrine, Junenji Temple (Fukurokuju) Fukurokuju is the deity that presides over three virtues of luck, wealth and longevity. He is also the personification of Taizan Shinkun, which it the symbol of the South Star. It is based on the legend of Sanshakubo (considered to be a Tengu, or a long-nosed goblin), who was related to Akiba shrine and the divine virtue of Fukurokuju. ●Gohonjin Fujiya (Hoteison) Hoteison is a synonym a zen monk from the ancient China named Kaishi, who was also believed to be the reincarnation of Miroku Bosatsu. He assumes the attire of an anchorite while saving people. This particular statue of Hoteison had been handed down in the family of the lieutenant general Kousaku Aruga, who was the last captain of the battleship Yamato before donated. ●Seson-in (Bishamonten) One of the guardian gods who guards the north of Buddha’s world. The pagoda in his left hand symbolizes his devotion to Buddha, the stick in right hand the purity of his act as the guardian of the teachings of Buddha. Made from a single piece of cypress wood is a cultural property designated by the city. ●Okuninushi Shrine (Daikokuten) Daikokuten guards the three treasures of Buddhism, and used to be an Indian deity who symbolized battle. He was unified with Okuninushinomikoto when introduced to Japan and became the god of harvest and fortune in folk beliefs. ●Renchizan Ojo-in (Benzaiten) Benzaiten is an Indian goddess of river who presides over music, who grants blessings in scholarship, fine arts, oratory and wisdom. Uga-benzaitensha inside the precinct has been worshiped as the deity of performing arts in the Gondo area. ●Nishinomiya Shrine (Ebisu) Holding a fishing pole in his right hand and a sea bream in left, Ebisu is a deity that gives blessings to a wide range of issues including rush of business, safety of the household, huge harvest, calamity avoidance and bringing good luck. Two famous events, each named “Ebisu-ko” and “Daienka Taikai” are held in November. Each of these shrines has the vermillion stamp for each of the Seven Deities. The stamp for Fukurokuju is located in front of the main hall of Junenji temple. Pilgrimage's Stamp fee 100 yen at each temple and shrine. *Zenkoji stamps outside of the Shichifukujin Meguri cost 200 yen each. *Some places have self-service stamps. Test well in order to get a good stamp. *If stamps were not available in some parts of pilgrimage, it can be acquired in Saikoji temple, Seson-in and Nishinomiya shrine. 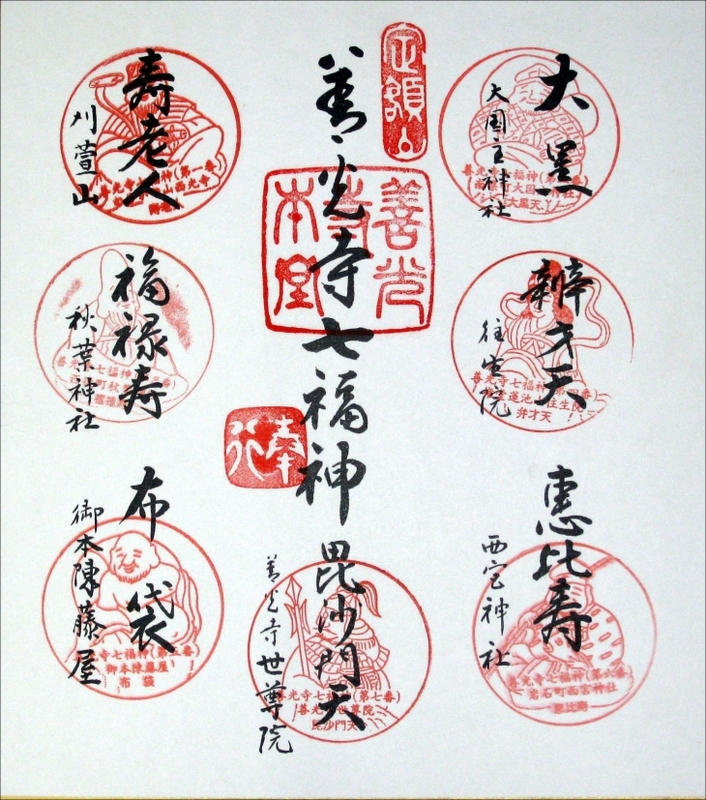 The paper for stamps (800 yen) can be acquired in Karukayayama Saikoji temple (TEL:+81-26-226-8436), Nishinomiya shrine (TEL:+81-26-235-6633), Seson-in Shakado (TEL:+81-26-232-4724), as well as at Nagano City Tourist Information Center inside Nagano Station building.